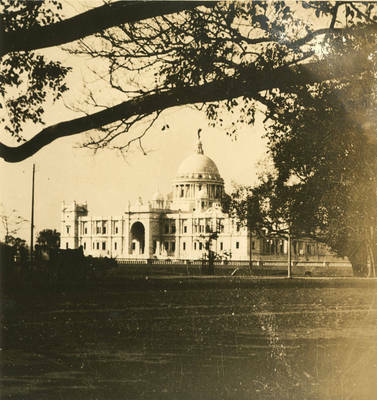 "Victoria Memorial Hall, Calcutta, India"
Victoria Memorial Hall, Calcutta, India. Architect Sir William Emerson laid down the actual plan of the memorial. The design of the structure represents a fusion of British and Mughal architecture. Lord Redesdale and Sir David Prain designed the gardens. White Makrana marbles were used in the construction of Victoria Memorial Hall and the building was inaugurated in the year 1921. The massive hall is 338 feet (103 m) by 228 feet (69 m) and rises to a height of 184 feet (56 m). BW photograph, 7.5" x 7.25"